The Elegant Baby Gift Box is the ultimate way to give your Elegant Baby gift. This elegant and sturdy gift box feature a magnetic closure, permanent grosgrain bow and the ability to personalize the inside making the perfect gift box for your Elegant Baby gift. Let us wrap it for you for FREE. Free Elegant Baby gift boxing on all Elegant Baby orders over $99.99 qualify for free . 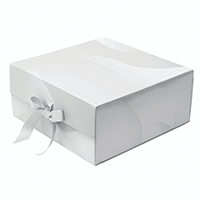 Give your Elegant Baby gift boxed in a beautiful Elegant Baby signature box!